With every new year, it is important to survey the SEO landscape and see what’s changed. Search engines are always being tweaked to keep up with Internet trends and maintain quality searches, so the eCommerce and SEO industries have to keep up with them. By staying on top of the latest SEO trends, businesses and marketers can better refine their strategies and maximize web traffic and conversions. We’re well into the year, so it is worth taking a look at how leading eCommerce platforms are handling eCommerce SEO in 2018 and their plans for the future. It is important to keep in mind that a majority of SEO activity has to do with keeping up with Google’s organic search algorithms, so there will be plenty of similarities between platforms. However, each platform also has its own priorities to keep in mind as well. Here is how some of the most popular eCommerce platforms like Shopify, BigCommerce, and Magento are addressing eCommerce SEO in 2018. 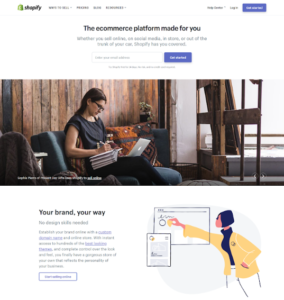 Shopify has built up a reputation as a favorite eCommerce platform among small and medium-sized business owners who are looking for a simple, yet sophisticated platform for their online stores. Business owners who want to get a great-looking store up and running fast turn to Shopify, which doesn’t require advanced coding skills. One of the major ways to keep up with Google’s latest algorithms is to ensure your website has an enjoyable user experience. Thankfully, this is easy to do with Shopify. You can use the platform to generate rich content and blog articles with long tail keywords, add customer reviews and testimonials, applicable video and high quality photos, and appealing design with easy site navigation. Encourage backlinks from high quality, authoritative sites. Develop a site structure that appeals to Google’s algorithms. Create unique and descriptive page titles and meta descriptions. Shopify offers great social media tools to take advantage of. BigCommerce is another major player in eCommerce, and is used across all industries, by major businesses such as Toyota and Martha Stewart. BigCommerce is similar to Shopify in that it is relatively easy to use for beginners, though it does include additional customization options that make it more appealing to advanced users and larger businesses. Much of the same SEO tools that are used in Shopify apply with BigCommerce as well, though the platform also has its own quirks. 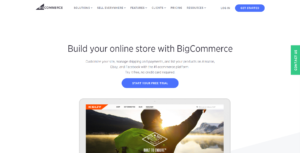 Like Shopify, BigCommerce specializes in building a great-looking website that engages the user with rich content, videos, quality photos, and easy navigation. It is important to make use of BigCommerce’s website-building tools to create an exceptional customer experience. BigCommerce is also good at building mobile sites. This is very important for eCommerce SEO in 2018 and will only rise in priority in the coming years. Google has made a move to mobile-first indexing, making mobile-friendly sites more important than ever. With BigCommerce it is easy to integrate Amazon, Google Shopping, eBay, Facebook, and sites that do comparisons. Any eCommerce marketing specialist in 2018 will tell you that consumers love comparison shopping. So, consider integrating these auxiliary channels to boost relevant traffic. BigCommerce has a huge amount of built-in features to enhance your search engine marketing campaign with, such as newsletters, coupons, and analytics. Magento is one of the most popular eCommerce platforms on the market. Due to its open source nature, the program is very flexible and it is constantly being worked on by a large community of developers. Magento is much more customizable than Shopify or BigCommerce, though as a result, this platform is much more challenging to use and requires a professional’s touch to get the most out of it. Magento’s customizability does make it more suitable for larger businesses that require more granular SEO tools to manage multiple stores and branches, larger websites, and larger inventories. Because Magento is highly customizable, and has a huge number of extensions, you can make a really unique website with a great user experience. As with the other platforms, you can edit site structure and architecture, title tags and meta descriptions, photos, URLs, and much more in order to be SEO friendly. You can edit robots.txt files and sitemaps to optimize your site as well. Great social media integration options. This is just a snapshot of what SEO looks like on three of the most popular eCommerce platforms in 2018. Need a professional to help you get the most out of your eCommerce platform of choice? At Coalition Technologies, we know all of the ins and outs of every major eCommerce platform, and can use our SEO tools to maximize your traffic and conversions. If you’d like to maximize your eCommerce marketing in 2018, give us a call today at (310) 736-2327 for a free quote.